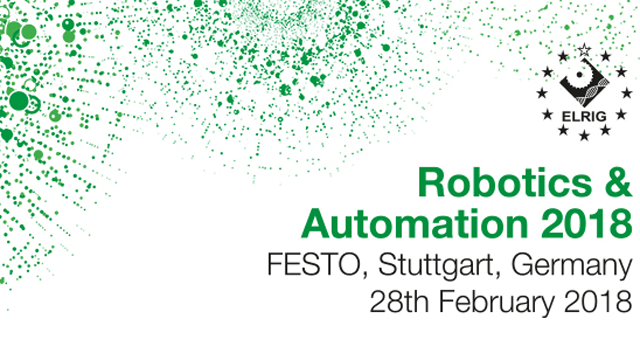 Festo in Esslingen near Stuttgart, Germany on 28th February 2018. This one day conference will provide an exclusive opportunity to network and be involved in inspiring and interesting discussions with opinion leaders in instrumentation, informatics, lab automation, strategy developers and industrial automation experts together with a strong and aligned vendor community. Robotics & Automation 2018 is a ELRIG meeting program and will focus on how we make future laboratory solutions smarter to deliver more to science. Speakers from leading organisations will present a program focused on the fundamentals of the smart lab considering contributors such as Industry 4.0, Internet of Things (IoT), Artificial Intelligence, automated decision making, cloud processing and big data acquisition and handling. As laboratory experimentation, data and interpretation become increasingly complex, automation and information technology (IT) solutions become essential for successful drug discovery. The lab of the future will open unforeseen potential as higher throughput, precisely controlled automated processes; with smarter information collection and analysis, solve today’s problems and bring new opportunities. The aspiration of this “future lab” is to empower scientists to simply perform the right experiment and bring new ideas to light. Look here for the programme of Robotics & Automation 2018. The location is at Festo, Ruiter Straße 82 73734 Esslingen, Berkheim, Stuttgart.